We’d love your help. Let us know what’s wrong with this preview of Bottom of the Pot by Naz Deravian. To ask other readers questions about Bottom of the Pot, please sign up. This is my family's new favorite recipe book. We've been using it several times a week since we got it, and we can't get enough of it. I particularly recommend the beet and lentil soup. 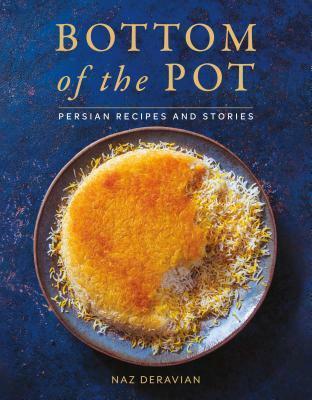 Some of the recipes are a bit involved, such as the tahdig, so they're best done as weekend or party dishes, but this is a beautiful book that will definitely turn you on to Persian cuisine. This is just as much a memoir and food history account as it is a cookbook. It makes me want to make all the Persian things. Deravian immigrated to Canada from Iran in grade school. She started cooking Persian meals after college when she’d moved to LA. The book invites readers to participate in making these home cooked dishes influenced by her multicultural background into their own and encourages being flexible to “make it delicious” to each individual. She includes an appendix of needed ingredients and also suggests possible substitutions for hard to find dishes like Persian limes or verjuice. She highlights Persia Deravian immigrated to Canada from Iran in grade school. She started cooking Persian meals after college when she’d moved to LA. The book invites readers to participate in making these home cooked dishes influenced by her multicultural background into their own and encourages being flexible to “make it delicious” to each individual. She includes an appendix of needed ingredients and also suggests possible substitutions for hard to find dishes like Persian limes or verjuice. She highlights Persian food as being dominated by sour flavors and herbs. She also recommends putting herbs in the food processor, which has never seemed like a good idea to me. Instead of a nice pile of lively chopped greens, I always get mush. A large knife and a lot of practice can make short work of a pile of herbs. Spin and store unchopped clean herbs in your salad spinner if you are planning ahead. The author describes the necessary spices, how to prepare them and how to create spice blends. She uses dried herbs that many chefs recommend only using fresh like mint. Recipes start with their Persian name, then the name in english followed by a paragraph or two describing the dish and giving it context, then serving info and ingredients. Directions are detailed but not specific with pan sizes. A very useful make ahead, plan ahead and prep ahead section is included. Almost every recipe has a full, color page picture. Sections are divided by how a meal would progress with appetizers at the beginning and desserts at the end. Essays describe personal stories and provide an engaging voice to the book as well as setting the scene for lively, comfortable and vibrant Persian meals. I enjoy reading her recipe intros which often offer good ideas like soaking walnuts before serving to get rid of the bitterness. A savoury memoir and recipe book. In my quest to cooking perfect basmati rice Deravian has some good suggestions.